Hey party people! So I spent this past week in New Jersey with family, which means that I spent the week not really cooking and thus not really producing anything for this little corner of the internet. And yesterday it was all I could do to curl up on the couch and lament the crummy weather, so I wasn’t really that productive here in Maryland either. And when I woke up this morning I was all jazzed to make something but then it was cold and rainy and the thought of cooking another in between season vegetable made me hide under the covers. So I’m using my get out of jail free card for this week. I dug up an old post that Dan was supposed to author started and decided that today, when all I want are huevos rancheros with salsa fresca, I would share how we grow, harvest, and dry basil. In the interest of full disclosure I’ll admit that while we had the same two basil plants (grown from seeds) going strong and producing for over a year, they died this past summer because the only place in our living room that gets direct sunlight is also where the air conditioner is located. We’re really hoping our next place has outdoor living space. 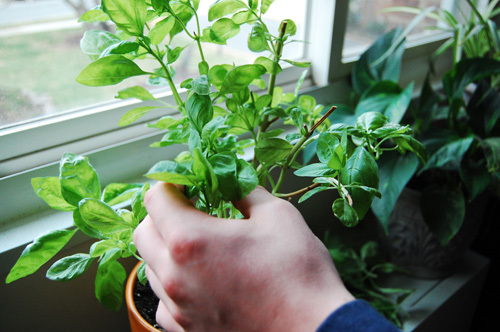 Growing basil, like any other plant, means finding the right combination of light, warmth, and water. 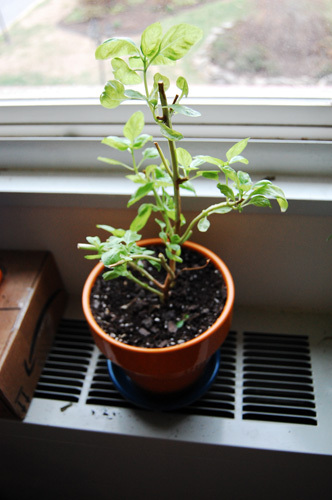 Basil needs a good 4-5 hours of direct sunlight and temperatures of 60 and up. To begin from seeds, fill your pot with dirt, poke a hole with your finger 2-3 inches deep, and sprinkle seeds inside. Cover with dirt and water, but do not soak. Water a little daily, sparingly. Soon you’ll see sprouts. It’s okay if you have multiples, when they’re 4-5 inches tall you can separate them, leaving 1 per pot. 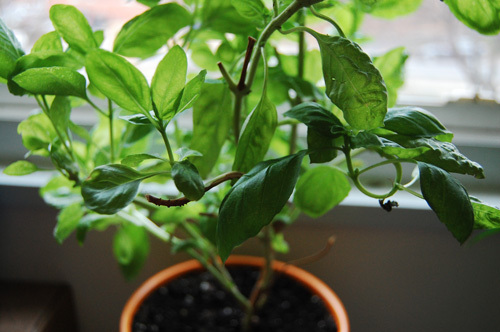 Your basil plant will grow steadily until the stem is thick and it’s producing large amounts of leaves. The key to getting the plant to continue to produce is to keep it from flowering. This means trimming it once or twice a month, depending on growth, and pinching off any flowers that form. 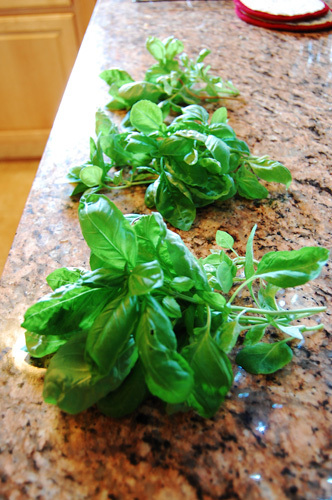 If you’re regularly using the plant for fresh basil, you shouldn’t have to actually cut it back frequently. 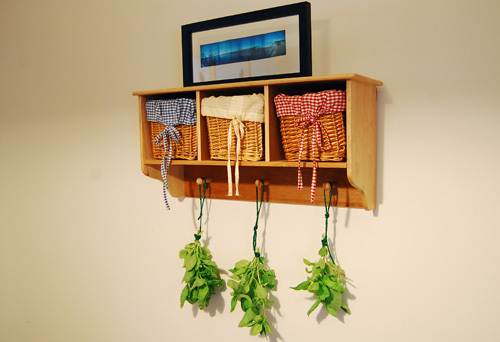 If you’re using it for fresh basil occasionally and would also like to dry some, simply cut off the amount you would like to dry and hang it upside down, from the stem, in a cool dark place. The leaves shouldn’t get any direct sunlight and should hang until they are fully dried. Then grind, chop, or leave them whole and enjoy! This has been an odd week. On the one hand, I got incredibly amazing scream into my phone news. On the other hand, I got heart crushing, cry for hours news. I’ve been reeling all week, fluxing between being deliriously happy and being a sobbing mess. And no, I’m not pregnant. I’ll tell you more about the exciting news when the time comes and as for the crap, well, I’ve been self medicating with cookies, hamburgers, and meatball pizza all week, trying to get over it. I’ll be running off this particular mess for MONTHS. Anyway, part of the week also included planning my ideal spring meal. And while the foods changed back and forth the drink was always the same- lime fizz. I am a lime fizz junkie. 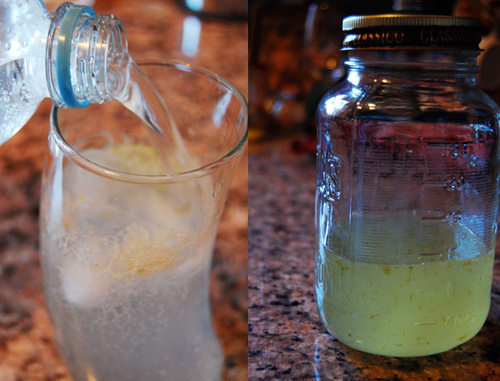 I love the fresh flavor, the addictive bubblies, and of course that last sip where the remnants of the simple syrup dance around with the tart lime. It’s the perfect drink for me and thinking about it makes me want to throw on a sundress and dance in a meadow. 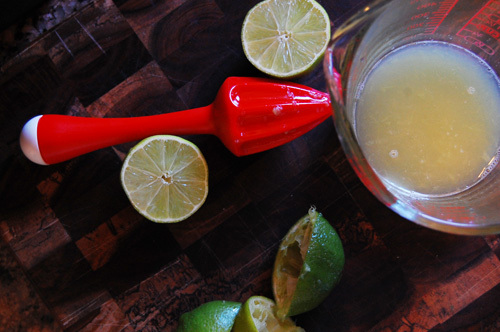 Start by making your lime simple syrup. 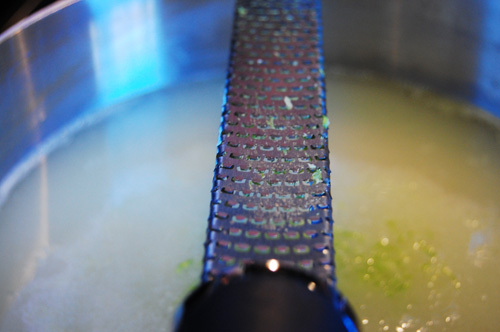 You want 1/2 cup lime juice, which, depending on the size of your limes, is 2-4 limes. Combine that with the water and sugar in a medium size pan. Heat until the sugar melts then remove from heat and let cool. 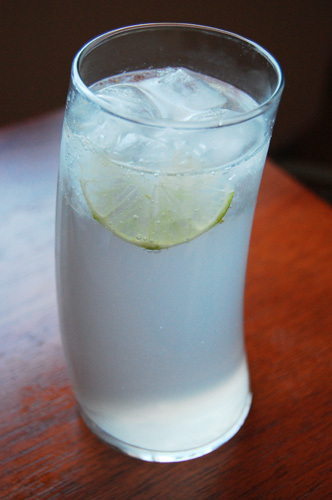 In order to make your drink, combine 1 ounce of the syrup, 1 ounce fresh lime juice, and club soda. And enjoy! I’m a big fan of crumbles. 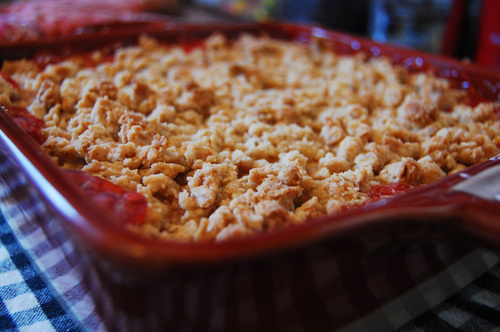 By definition, a crumble is a fruity pie-filling like base with a brown sugar/flour/butter top crumbled over it. These are frequently made with apples, oftentimes referred to as crisps. Whether you call it a crisp or a crumble and whether you fill it with berries or rhubarb, they’re just so delicious. This one was no exception. I set out to make a rhubarb crumble for a nice dinner this weekend. Usually with rhubarb pies and crumbles the rhubarb is paired with a citrus juice, typically lemon or orange. So I was so excited when I got to the grocery store and saw blood oranges. I thought, how perfect! Unfortunately when I got home the reality hit that the produce sorters at the market needed to reevaluate their process. All three pieces of fruit I purchased labeled “blood orange” were in fact, not. Just regular oranges. Luckily for me I had some blood orange juice in the fridge, so all was not lost. Though in the future I may pick out my citrus a little more carefully. A blood orange is an orange with a bright red center, a mutation of the sweet orange. 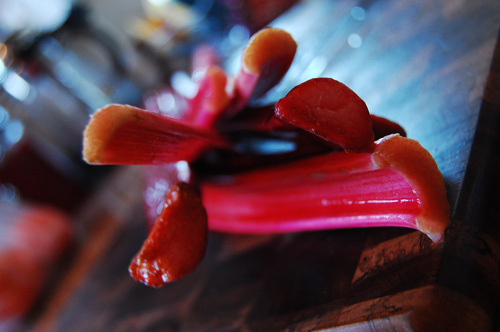 Because of this it is beautiful, a little sweet, and the perfect compliment to the tart flavor of the rhubarb. I also learned from Nigella Lawson (via Deb of Smitten Kitchen), that adding a little baking powder to the topping of your crumble increases the crumble to fruit ratio without having to up the butter content, which was exactly what I was looking for. It was yummy, beautiful, and the perfect way to welcome in March. Which, it turns out, is not the same thing as welcoming spring. 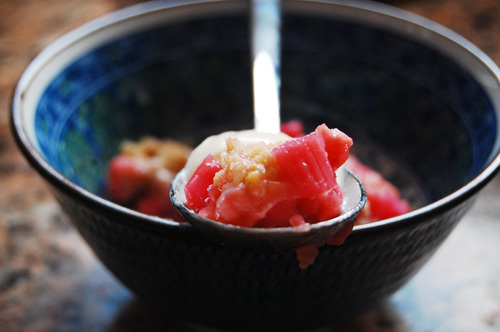 Clean and chop your rhubarb. Place in baking dish. Add the juice from 2 blood oranges. Add zest, sugar, and corn starch. Toss. In a separate bowl combine melted butter and all other topping ingredients. Stir. 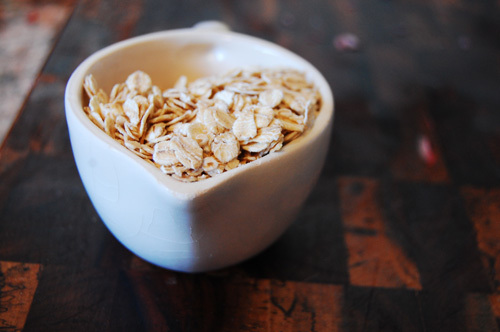 It should be solid and clump together and on your spoon. Use your fingers to crumble over the top of the fruit. Bake at 375 for 45 minutes. Serve with ice cream.